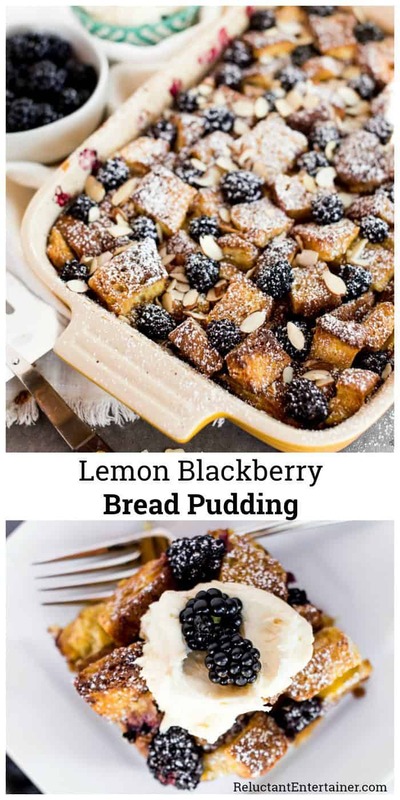 Enjoy Lemon Blackberry Bread Pudding with Mascarpone Vanilla Frosting, a not-too-sweet bread pudding (or breakfast casserole). Serve warm out of the oven. This post is sponsored by Oregon Raspberry and Blackberry Commission. 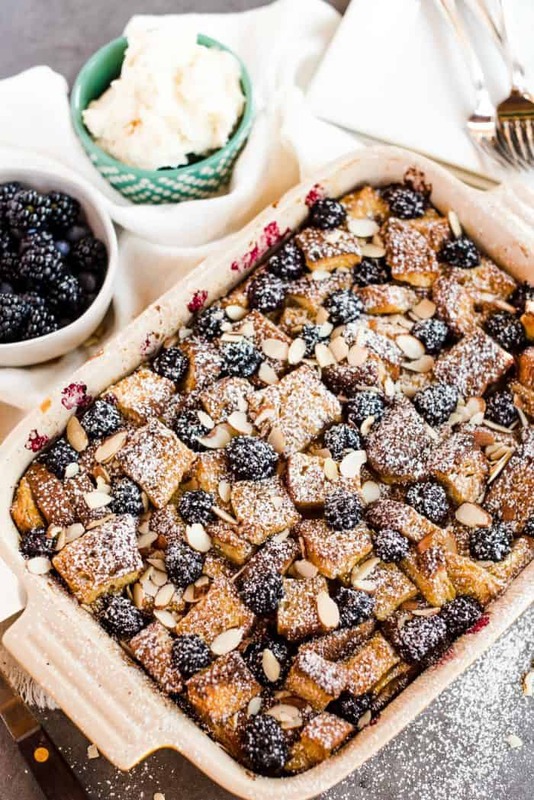 Friends, when I think of a bread pudding, I think of a special occasion. 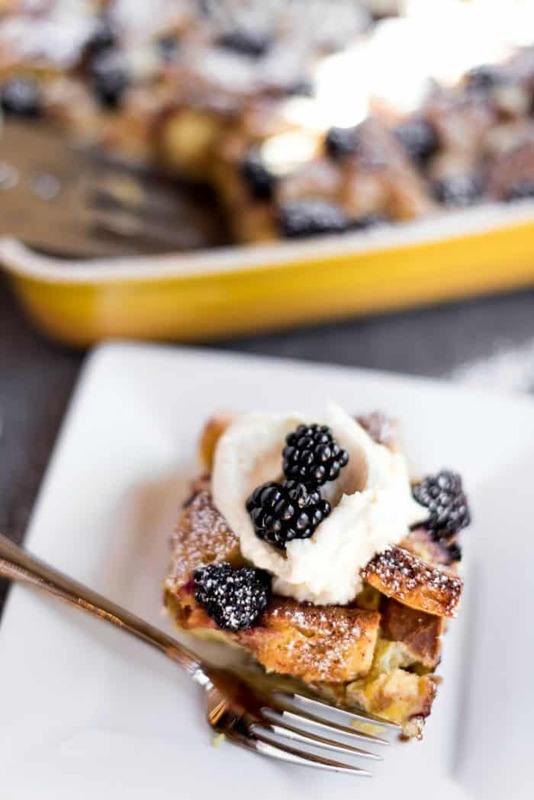 This yummy Lemon Blackberry Bread Pudding can be served as an elegant dessert (don’t forget the Mascarpone Vanilla Frosting), or as a breakfast casserole for a brunch! 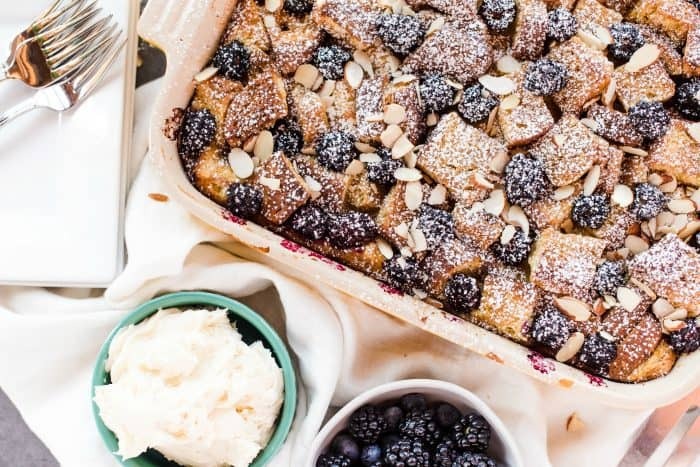 We’re still enjoying end-of-the-season fresh Oregon blackberries, but with this Lemon Blackberry Bread Pudding you can use frozen berries! Which makes it perfect for fall and holiday entertaining. What I love about cooking with Oregon berries is that we can buy them frozen during the off season. 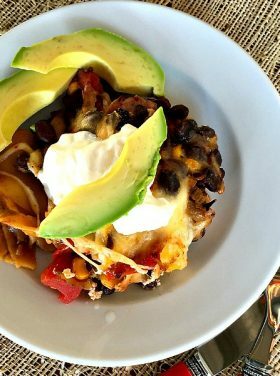 With almost every recipe that uses fresh, you can use frozen! They are so easy to cook with, and frozen actually tastes just as good as fresh. Oregon is the ideal growing environment for berries: soil, air, water! I visited the fields a few years back and loved seeing firsthand that Oregon’s family farms grow exceptional, consistently high quality blackberries and raspberries. Did you know that Oregon berries are picked at the peak of ripeness, and frozen within 24 hrs of being picked? This locks in a maximum taste, juiciness and nutrition. Frozen Oregon berries are available year round, so you can use just what you need, and save the rest for later, with maximum nutrition and taste! 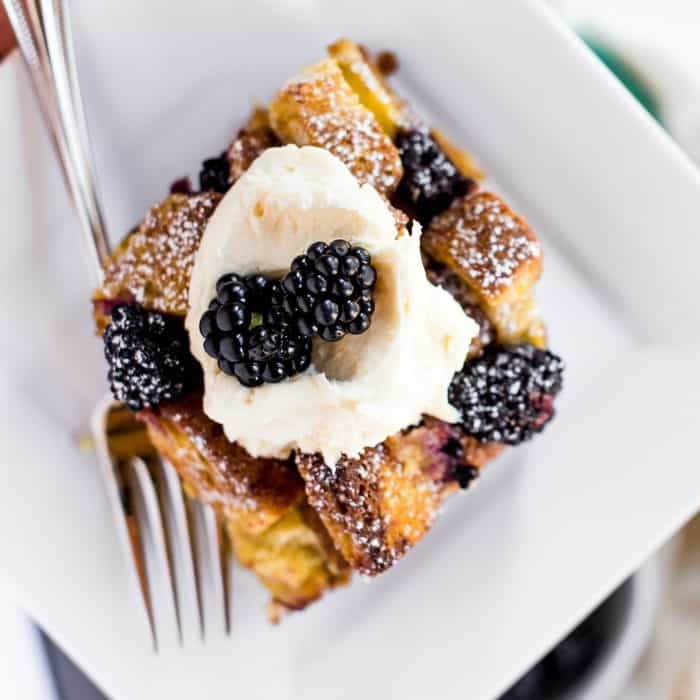 Today’s dessert or breakfast casserole, Lemon Blackberry Bread Pudding, uses frozen blackberries, and oh my … the great flavor and color is locked right in! Because it’s the end of the season, we garnished the dish with fresh berries and powdered sugar (but you can use frozen for the garnish). If you’re looking for these brands, looks for: Stahlbush Island Farm, Willamette Fruit Co, Columbia Fruit, Townsend Farms, and Sturm’s Berry Farm. 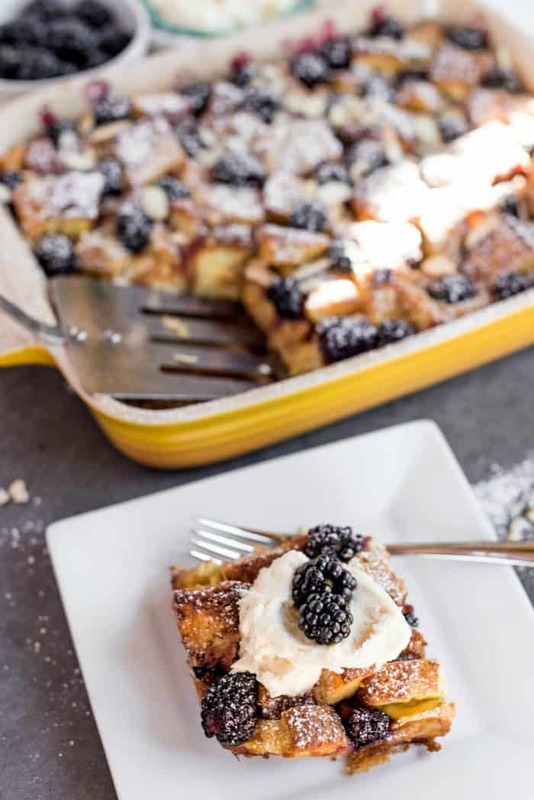 Have you thought about hosting a fall brunch, or serving a hot bread pudding for a dinner party? Combine eggs, milk, sugar, and spices in a bowl or blender and mix until smooth. Grease a 9x13 pan. Spread bread cubes inside, then pour over egg mixture. 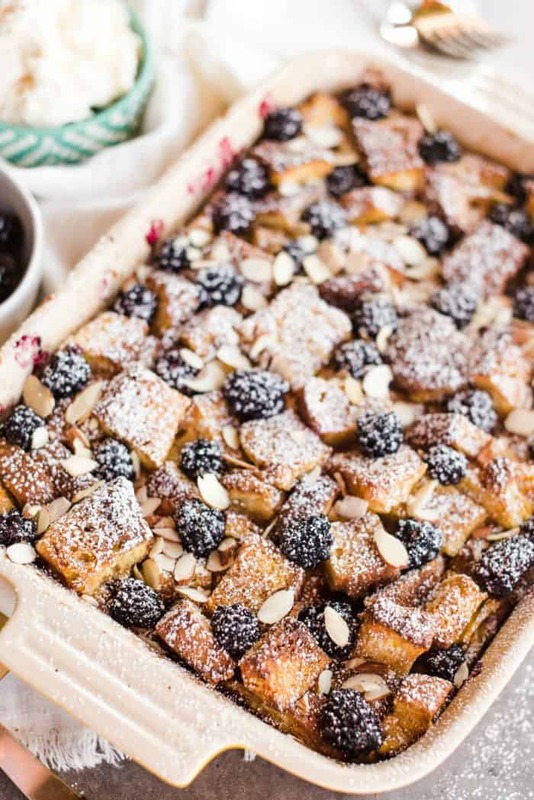 Top with blackberries and a sprinkle of coconut sugar. 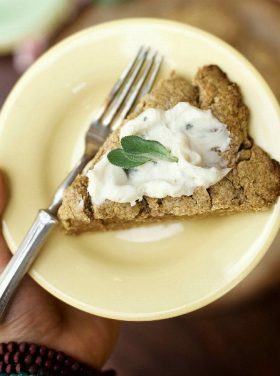 Allow bread to soak for a couple of hours, or even overnight. When you’re ready to bake, place in oven for 40-50 minutes. In a mixer, combine mascarpone, vanilla, sugar, and lemon. Mix until smooth and creamy. 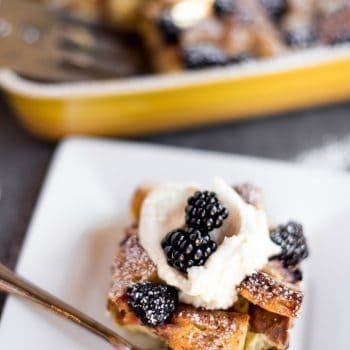 When bread pudding is cooked, serve warm with a dollop of mascarpone and fresh (or defrosted frozen) berries. 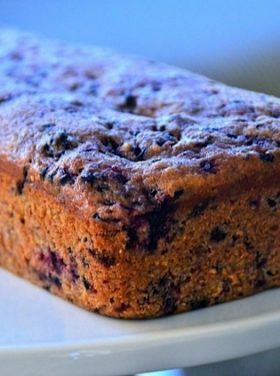 More frozen berry recipes: Oven Baked Salmon with Blackberry Barbecue Sauce [RE], Oregon Marionberry Galette [RE], Healthy Blueberry Muffin Recipe [Well Plated] and Mixed Berry Crisp [Spend with Pennies]. This post is sponsored by the Oregon Raspberry and Blackberry Commission!